Fancy a romantic getaway to St. Martin for Valentine's weekend? Check this out! 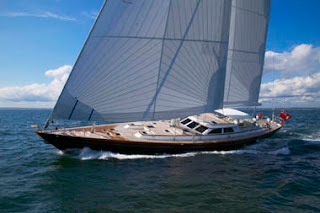 ANDROMEDA LA DEA, a 154-foot Perini Navi Ketch, is offering a 4-night Valentine's special for $65,700 plus all expenses. Thank you Richard & Denise for giving our repeat clients a wonderful vacation aboard Contessa! Without question we enjoyed our charter. This was the 5th sailing vacation for us and the first for the P's. Laura P. (age 21) and Michael P. (age 18) had the time of their life. Capt. Richard and Denise couldn't have been nicer. The Contessa was a beautiful boat. The cabins were very clean and comfortable. The meals were delicious and the food plentiful, which is important when traveling with two young men (ages 15 & 18). This is the 4th time we have chartered with Paradise Connections and everything went smoothly. I would recommend you to anyone. I am sure we will be taking another sailing vacation sometime in the next 2 years. 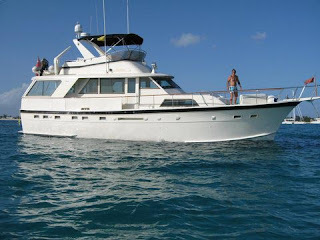 We would definitely charter again with the Contessa. It not too early to book for NEXT Christmas / New Years !!! This morning's Dutch bridge opening in St. Maarten was quite moving... As the sailing yacht PERSEUS entered the lagoon everyone saluted the yacht with their horns. It lasted about 5 minutes. Anyone for racing in the St. Barth's Bucket? ANDROMEDA LA DEA IS AVAILABLE! Don't miss this incredible opportunity to charter a first-class yacht to race in the Bucket! 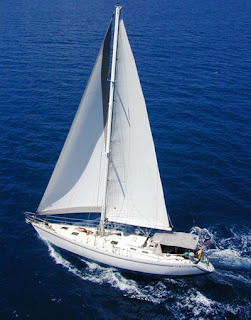 The charter yacht Corus, a 45-foot ketch, owned and operated by Bill & Ann Hasted, has instituted a new pricing structure through the end of the summer 2009 season (thru mid-December). Effective immediately, rates have been reduced to $4,800/wk for an all-inclusive charter for two guests (not each!). 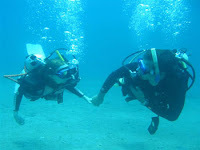 Bill is a dive master and their rates include one dive/day for certified divers. Gear, but not air fills, are also included. Also, there is no charge for a child (12 years and under) using the navigator's berth and sharing the parent's bathroom. If you are a single person who would like a crewed charter aboard Corus just by yourself, let us know and we'll see about a special rate for singles. Come on down and live a little! Alexis is a 38-foot Admiral catamaran which accommodates up to 4 guests in two cabins. 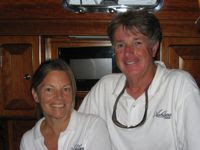 Bambi & Geoff, owner-operators of the catamaran Alexis, would like to announce that they are offering a 10% discount on charters in the Virgin Islands between March 13th and April 4th, 2009. Also, Alexis has opened up their calendar for this summer and will be chartering "down island" in the Grenadines. Promenade will open two more weeks in JULY 2009. July 6-13 and July 14-21, 2009... there may be a day or two of leeway in there... just ask! 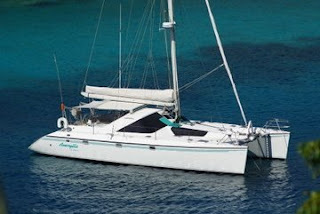 There are TWO possibilities to charter the popular 65-foot sail dive trimaran, PROMENADE this season. Firstly, we had a cancellation on a cabin we were holding for a repeat client, so there is still space available on Promenade's cabin cruise week of March 29 through April 4, 2009. This 6-night charter is $3600 for the cabin (rate for two guests, not each). Inquire quickly! Secondly, there is ONE week open on Promenade's calendar: June 20-27, 2009. The rate is $18,900/wk for up to TEN guests! Inquire for 12. Here are a couple of photos of rays that Kerry took yesterday near The Baths during their current charter. 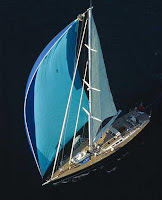 S/Y FORTUNA - An exciting opportunity at an affordable price!!! 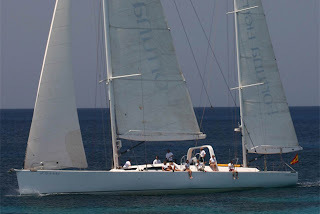 February 28 to March 8, 2009 starting and ending in St. Martin - explore the beautiful anchorages in Anguilla and participate in the Heineken Regatta for the last 3 days. Free days! Book a 7, 8 or 9-night charter and get one additional night FREE. Book a 10-night or longer charter, and get TWO additional nights FREE. RATE: $57,500/wk for up to 8 guests, plus all expenses. KALIKOBASS II: 104-foot Fauroux-designed performance sloop built at Trehard, is in outstanding condition following a $1 million+ refit last winter including new teak decks, flush deck hatches, etc. Four spacious double staterooms each with air conditioning, TV, DVD, VCR, CD player, fridge & en suite head/shower. All four of KALIKOBASS' staterooms can convert from two twin beds to one king size bed. Don't wait too long to take advantage of this exceptional opportunity! Congratulations are in order as the crew of Ashlana, Captain Tom Hampson and Chef / Mate Christie MacConnell, became engaged on Christmas Eve! ASHLANA is offering reduced winter 2009 rates of $10,700/wk for 2 guests, and $11,900/wk for 4 guests - with the added bonus of 8 days for the price of 7, both effective for the remainder of the Winter 2009 Caribbean season. Rate terms are: inclusive except bar/beverages, local cruising taxes and /or fees, dockage and communications. 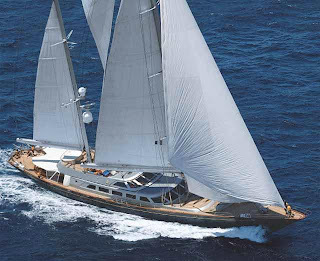 WHISPER, the beautiful 116-foot Holland Jachtbouw sloop, is offering a $10,000 discount for charters of 7 nights or longer taking place during the month of February 2009. 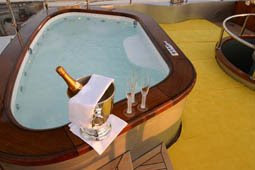 WHISPER accommodates up to six guests in three staterooms, and has a crew of five. 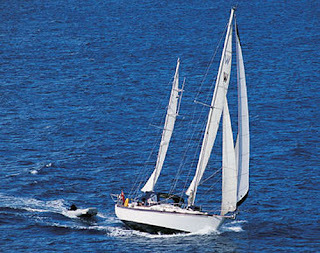 One of our favorite charter yachts, PHAEDRUS the 51-foot Morgan Sloop, owned and operated by Charles and Leslie with the help of ship's cat Lila, is lowering their charter rate through the end of summer season, December 14, 2009. 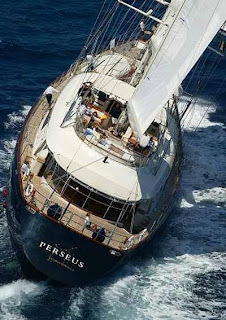 Don't miss this opportunity to charter Phaedrus this season at this exceptional rate! 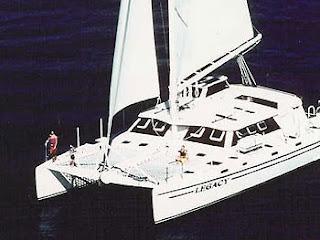 The 65-foot dive catamaran LEGACY is offering a special rate for Belize charters taking place in January, February, and March 2009. Wow, a $4,000 savings off their normal rate of $16,007 for 6 guests/6 nights! This is an all-inclusive rate (except tip, of course!) and they state 3-4 dives/day. Diving instruction is available at extra charge. The popular 65-foot sail dive trimaran PROMENADE, has one week available this season due to a recent cancellation. PROMENADE is now available for the week of Saturday, June 20-27, 2009. There is also the possibility of ONE cabin available on Promenade's cabin week of March 29 through April 4, 2009. This 6-night charter is $3600 for the cabin (rate for two guests, not each). Inquire quickly! 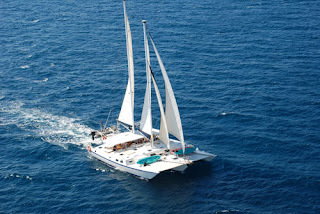 CATNAP, a 46-foot catamaran, is offering a discount on charters completed before February 11, 2009. 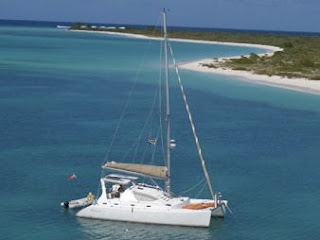 CATNAP offers what they term "Affordable Budget Crewed Charters". See their RATES page for details. BLITHE SPIRIT has had a 2-week cancellation and is now available from April 4-23, 2009. This means that they are open for Spring Break / Easter. Blithe Spirit is a 52-foot Irwin ketch, owned and operated by Michel and Dominique, a French-Canadian couple which cook fabulous meals. We love to be invited over to Blithe Spirit for dinner as they are wonderful people and we always have a great time. Superb chocolate mousse! Charter motor yacht ANALISA, a 60-foot Hatteras, has a few special offers to ring in the new year! ANALISA has waived the standard 10% premium added to charters of 5 nights or less. A short charter will be charged the strict daily rate (divide weekly rate by 7 for daily rate and multiply by number of nights aboard). ANALISA is offering a special family rate. A four-person family charter is only $12,420/wk. This is a savings of $1380. Not bad! CATAMARAN AMARYLLIS lowers their rates for the 2009 season. Amaryllis is a 45-foot Privilege catamaran that accommodates up to 6 guests in three double cabins. For family charters they are offering "1 child free". This means that family of four, for example, can get the 3-person rate of $9000. A "child" is defined as anyone 17-years old or under. Amaryllis also offers a "sleep over" rate for guests who arrive late into St. Thomas (after dark). Instead of staying in a hotel their first night, they can come directly to the boat. Amaryllis will have dinner and drinks ready. Breakfast will be provided the following morning and guests will be able to get a jump-start on their vacation. The price for this service is the equivalent of their half-day rate. Also, for those who want to take less than a week's vacation, Amaryllis is offering a 2-5 day USVI package and waiving the 10% surcharge for charters less than 6 days. No time is wasted clearing customs as the charter stays in USVI waters. 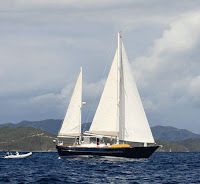 Pick up can be on St. Thomas or St. John making this ideal for guests who want some time on the water and some time ashore at a resort or villa.